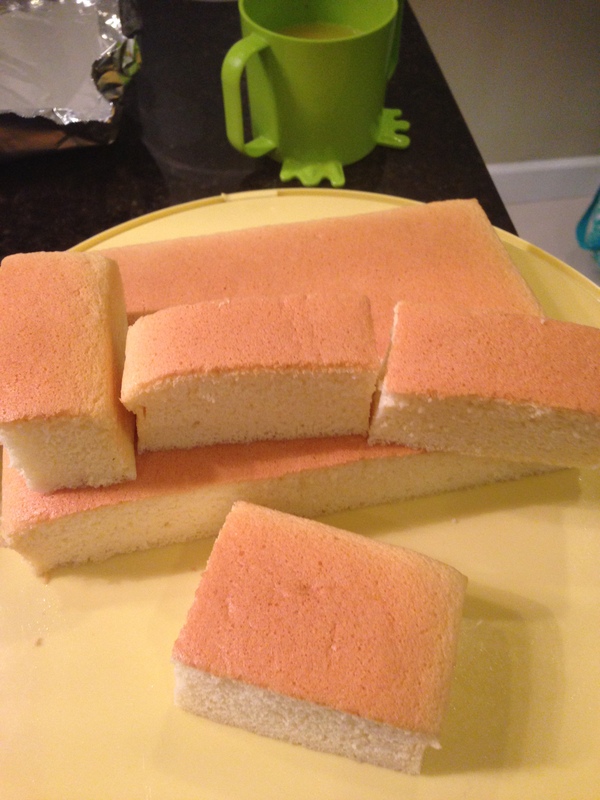 I highly recommend people who can read Chinese following this amazing step-to-step recipe (see below for the link) to make this extraordinary sponge cake that’s so soft and moist (thus the name Cotton Cake). The smooth surface doesn’t erupt like the chiffon / sponge cake, and it looks so nice and pretty. The recipe is not too sweet and uses a lot less oil than my usual sponge cake recipe, so it’s actually a lot healthier than traditional cake. I am just translating here for my dear friend L, an avid baker who is in search of a good sponge cake recipe. L, hope you will find success making this cake! But don’t keep for too long at room temperature in a tight container. My cake turns yucky durian like flavor after being in a air-proof container at 48 hrs, so odd!! So I had to throw it away, what a waste, as it was a beautiful cake for the first 24 hours. May be I should keep in the fridge, or even better, just finish it as soon as possible!! Original recipe in Chinese: 入口即化的棉花蛋糕。。。分享。。。 | Giga Circle. Sift cake flour and put aside. Separate 3 eggs into egg yolks and egg whites. Then beat the 3 egg yolks and 1 whole egg with chopsticks or a whisk till mix. Stir 50 gm milk into the egg mixture with chopsticks / whisk. Heat oil in a small pot till hot. Remove from heat when starting to see oil movement in the hot pot. Cool briefly, then add the sifted cake flour into the hot oil. Use a spatula to mix quickly into a hot batter. Continue to stir until the batter becomes smooth, then cool slightly. Pour the hot oil/flour batter into the egg yolk mixture. Add salt to this mixture then use a whisk to mix well into a homogenous mixture. Set aside. Use a hand electric mixer to beat 3 egg whites and 2 drops of vinegar using low speed till frothy (appears of bubbles like fish eyes). Then add 1/3 of the sugar into the egg whites and continue to beat until the bubbles become very fine. Add the remaining 2/3 of the sugar into the egg whites till soft peaks (not stiff). When you lift the up the mixer, the egg whites should be firm but the tip of the soft peak should be pointing down very slightly only. Don’t overbeat, otherwise it will be difficult to mix with the egg yolks later. Take 1/3 of the beaten egg whites and put into the egg yolk mixture. Use a spatula to cut and fold into the egg whites. Take note not to stir in circles as this would damage the well beaten egg white pores. The proper way to mix is to gently lift from bottom to top. When mixed, pour this into the remaining of the egg white. Fold gently using the same method until it’s homogenous. Pour into a non-stick pan (I sprayed with PAM as well), and shake gently a couple times to remove the big bubbles. Bake at pre-heated oven at 170 degrees C using water bath method. Put the non-stick pan into a larger baking pan that’s filled with hot water. Bake for 10 minutes, then reduce to 150 degrees C and bake for another 40 minutes. Make sure you added enough water in the beginning because the oven should not be opened during the baking. Check for doneness using a toothpick, it should come out clean if the cake is done. Since every oven is different, adjust the baking temperature accordingly.